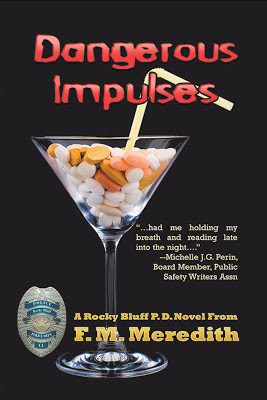 Denise Weeks, Mystery Author: GUEST POST: Marilyn Meredith's DANGEROUS IMPULSES blog tour! GUEST POST: Marilyn Meredith's DANGEROUS IMPULSES blog tour! I'll step aside and ler her talk. Perseverance has been my mantra since the beginning of my career as a writer. I could easily have given up long ago and never had the great time I’ve had all these years. None of it has been easy--and getting and keeping my Rocky Bluff P.D. series going is a good example. I started writing the series when my son-in-law was a police officer in the town we both lived in. He’d come home with tales of what he did on his graveyard shift. Several things happened during this time period to men on the department and my mind began perking. The first novel in this series was Final Respects. I took bits and pieces of what I’d learned along with other things I knew about, sprinkled them with lots of imagination and this first book was born. I landed an agent and I kept on writing. I had three more books done and submitted them. The only encouragement I received was that I came up with great titles. I finally gave up on the agent. While studying the big Writer’s Digest Market book, I found a publisher who was looking for police procedurals. I submitted Final Respects and it was accepted. The only catch was this publisher was an e-publisher. Who knew what that meant? Not me, or anyone else. I couldn’t even figure out how to buy my own book once it was published. And the only place to read it was the computer. That was not a successful venture. Time moved on, and the Rocket eReader became available, along with many new e-publishers. I found one that looked good, queried, and sent Final Respectsoff. The book was published as an e-book and trade paperback. It looked great. I purchased some and sold them. I sent the second in the series, Bad Tidings, to this publisher and it was published. The only problem was, though I could see people were buying the books because of reviews that appeared in various place, I never received a single royalty payment. When I asked about it, I was sent a small check and a rude reply. I parted company with that publisher. It took a while, but I finally found another publisher who did e-books and trade paperbacks and she accepted the next two in the series, Fringe Benefits and Smell of Death. She did a great job with editing, the covers, everything. Then the bomb dropped—she decided not to continue with the publishing business. I figured the next one I’d written, No Sanctuary, would never see the light of day. I met Billie Johnson, the publisher of Oak Tree Press at a Public Safety Writers Association’s conference. We became friends and saw each other at the next conference too. We began emailing one another and I queried her about No Sanctuary. In the meantime, she asked me to come to Illinois and present at a writer’s conference she was holding. I did, and she came to the motel where hubby and I were staying and brought me a contract. Yes, I signed it. This has turned out to be a wonderful partnership. Not only did Oak Tree Press publish that book, they’ve printed all the rest I’ve written and she republished the earlier books too both as e-books and trade paperback. Thanks, Marilyn! We wish you luck on your online excursions. Thank you so much for having me today, Denise. It was fun sharing my tale of woe that had a happy ending. There are many of us who are glad you didn't give up, Marilyn. You're a good writer and an inspiration to everyone who writes mystery fiction. There were many times I've felt like giving up since I began writing, but I'm glad I didn't. I guess we both had happy endings. Yes, Marilyn, you walked a rocky road, but it was worth it. You've entertained so many with your books. So many people have no idea how much an author has to go through. And, yes, Billie Johnson and Oak Tree Press rock! Still think cover is super for this story. Have had much trouble with more sites on tour. Glad this one worked. Calling my service provider to see if error is on my end. Thanks again for a delightful tour.